Late October I was contacted by FECBEK, an online shopping site for men and women, which they sell a variety of clothing, shoes, and accessories. The store asked me to choose any product under a certain value and review it. When browsing their website, I came down to three top choices, the long sleeve mini dress, the half sleeve graffiti dress, and the round collar half sleeve dress. I sent all three, and received an email stating the long sleeve mini dress will be shipped to me, which made my indecisive life a lot easier. The shipping process took forever; I just received this dress in the mail last week, and was contacted end of October. I’m not sure if the shipping typically takes this long, but if you really want something on there for a special occasion, you probably should buy it way in advance (literally). The dress itself was not a dress; it was a romper instead. I mean, if it were anyone else, they would be a bit disappointed, though I do like rompers so I was okay with it. But personally I think the company should put it under ‘jumpsuits/rompers’ and not dresses, because that is very misleading and dishonest. In addition, the material of the romper is very cheap. Online it says that the fabric is ‘chiffon,’ though it feels like a very cheap poncho-type material. 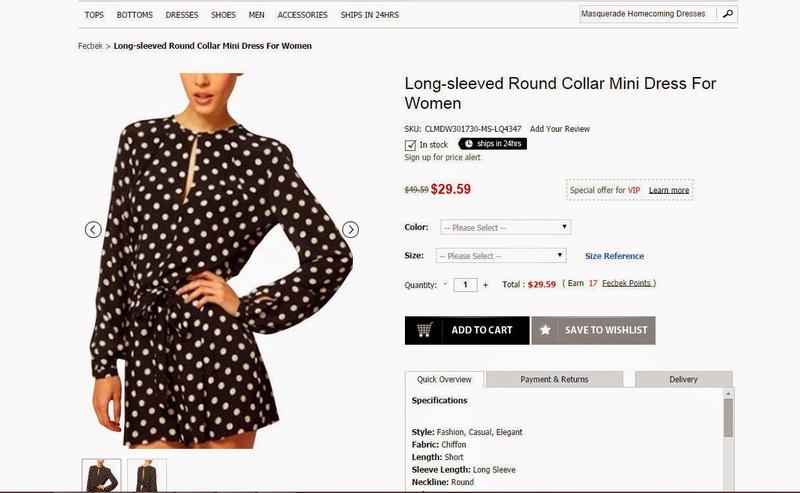 I mean this ‘dress’ costs only $29.59, so you kind of get what you paid for. Another down side was that the romper itself had loop holes around the waist, but did not come with an actual belt. Luckily, I have one from a different dress in my closet, and just used that. On the bright side, this romper actually looks cute on. So despite the mishaps, I really adore it. I wore this romper with my ZARA white strapped heels, black loose belt, and a black clutch. Although the cheap material, you can't really notice, it's just a very thin material. Polka dots are one of my favorite prints, so that's probably what makes it acceptable! Again, despite my negative review, I would definitely give this site another chance. They did have a variety of cute pieces on there for a reasonable price. I just hope that it really does not take two months for an item to be shipped to you! TWO more days to enter our giveaway!